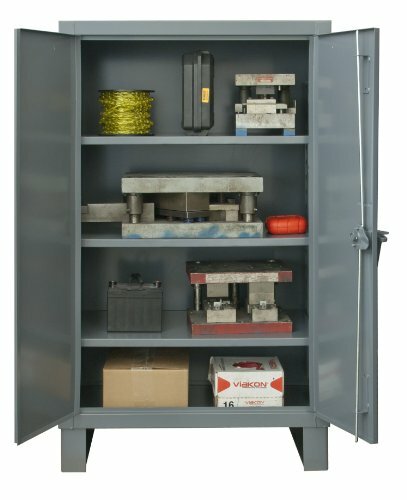 Durham extra heavy duty all welded 12 gauge steel lockable storage cabinet. 3-point cast steel locking handle with 3/8-inches diameter rods and provision for a padlock (padlock not provided). 14 gauge heavy duty shelves. Shelves bolt into place easily using fasteners provided and adjust on 2-1/4-inches centers. Doors have 7 gauge leaf hinges to prevent sagging. 6-Inches height base/legs which provide access for forklifts; pre-drilled holes allow for lagging to the floor (constructed of 3/16-inches steel). Durable gray, textured powder coat finish. Measures 24-inches length by 48-inches width by 66-inches height.